Some of you may be completely unaware of what is meant when the phrase "dust bowl" is used. 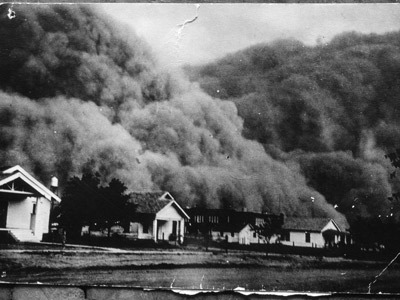 As a quick tutorial, the dust bowl was a devastating time in the history of our nation in which we had burdensome drought conditions coupled by extreme high temperatures, destructive winds, and harsh erosion in the 1930's. This onslaught of dust affected the majority of the nation in one way or another because this dust bowl weather pattern sorely taxed already struggling farmers as a result of economic breakdowns endured during this time as well. Dust bowl means that crops fail, cattle die, and farmers lose their land to banks because they are unable to keep up on their payments. 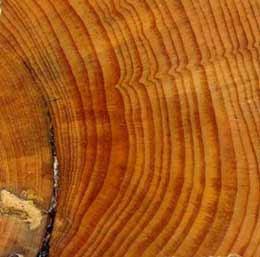 The harsh weather conditions lasted from 1933 to 1940. Rain finally came in 1941. During that time people moved from rural settings to suburban ones. You can imagine what kind of economic impact such devastation brought to the rest of the nation. Anyway, since I've volunteered to cook a nice dinner for 70 people tonight for the Blue and Gold Banquet (I wanted a test run to see if I could cook for that many people without going crazy--practice makes perfect, after all) I simply don't have time to write a stellar article. However, given the nature of Monday's article I felt that this one that has been posted in news media all over merited attention. I have read this article all over the place and can't seem to locate it's original author, nor have I seen anything to give proper copyright credits to it. So, if you are the author and if this article is protected by copyrights, I apologize and would certainly love to give credit where credit is due. Until then, I'm posting the article about the dust bowl in its entirety. There are some "claims" made in the article that might make you uncomfortable at first blush, but I can tell you from experience, if you were to search such claims you'll find a bounty of verification available to you from reliable sources. For decades, the heartland of America has been the breadbasket of the world. Unfortunately, those days will shortly come to an end. The central United States is rapidly drying up and dust bowl conditions will soon return. There are a couple of major reasons for this. Number one, the Ogallala Aquifer is being depleted at an astounding pace. The Ogallala Aquifer is one of the largest bodies of fresh water in the entire world, and water from it currently irrigates more than 15 million acres of crops. When that water is gone we will be in a world of hurt. Secondly, drought conditions have become the “new normal” in many areas of Texas, Oklahoma, Kansas and other states in the middle part of the country. Scientists tell us that the wet conditions that we enjoyed for several decades after World War II were actually the exception to the rule and that most of time time the interior west is incredibly dry. They also tell us that when dust bowl conditions return to the area, they might stay with us a lot longer than a decade like they did during the 1930s. Unfortunately, without water you cannot grow food, and with global food supplies as tight as they are right now we cannot afford to have a significant decrease in agricultural production. But it is not just the central United States that is experiencing the early stages of a major water crisis. Already many other areas around the nation are rapidly developing their own water problems. As supplies of fresh water get tighter and tighter, some really tough decisions are going to have to be made. Fresh water is absolutely essential to life, and it is going to become increasingly precious in the years ahead. Most Americans have never even heard of the Ogallala Aquifer, but the truth is that it is one of the most important bodies of water on the globe. It covers well over 100,000 square miles and it sits underneath the states of Texas, New Mexico, Oklahoma, Colorado, Kansas, Nebraska, Wyoming and South Dakota. Water drawn from the Ogallala Aquifer is used to water more than 15 million acres of crops. Without this source of water, the United States would not be the breadbasket of the world. That is why what is happening right now is so alarming. The following are 20 signs that dust bowl conditions will soon return to the heartland of America…. 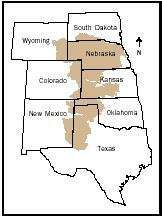 #1 The Ogallala Aquifer is being drained at a rate of approximately 800 gallons per minute. #2 According to the U.S. Geological Survey, since 1940 “a volume equivalent to two-thirds of the water in Lake Erie” has been permanently lost from the Ogallala Aquifer. #3 Decades ago, the Ogallala Aquifer had an average depth of approximately 240 feet, but today the average depth is just 80 feet. In some areas of Texas, the water is gone completely. #4 Scientists are warning that nothing can be done to stop the depletion of the Ogallala Aquifer. The ominous words of David Brauer of the Ogallala Research Service should alarm us all…. #5 According to a recent National Geographic article, the average depletion rate of the Ogallala Aquifer is picking up speed…. #6 According to the U.S. National Academy of Sciences, the U.S. interior west is now the driest that it has been in 500 years. #7 It seems like the middle part of the United States experiences a major drought almost every single year now. 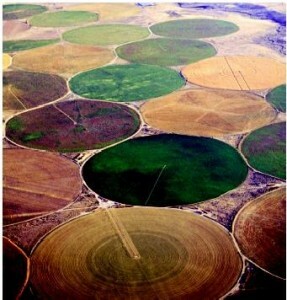 Last year, “the drought of 2011″ virtually brought Texas agriculture to a standstill. More than 80 percent of the state of Texas experienced “exceptional drought” conditions at some point, and it was estimated that about 30 percent of the wheat fields in Texas were lost. Agricultural losses from the drought were estimated to be $3 billion in the state of Texas alone. #8 Wildfires have burned millions of acres of vegetation in the central part of the United States in recent years. For example, wildfires burned an astounding 3.6 million acres in the state of Texas alone during 2011. This helps set the stage for huge dust storms in the future. #9 Texas is not the only state that has been experiencing extremely dry conditions. Oklahoma only got about 30 percent of the rainfall that it normally gets last summer. #10 In some areas of the southwest United States we are already seeing huge dust storms come rolling through major cities. You can view video of a giant dust storm rolling through Phoenix, Arizona right here. #11 Unfortunately, scientists tell us that it would be normal for dust bowl conditions to persist in parts of North America for decades. The following is from an article in the Vancouver Sun…. 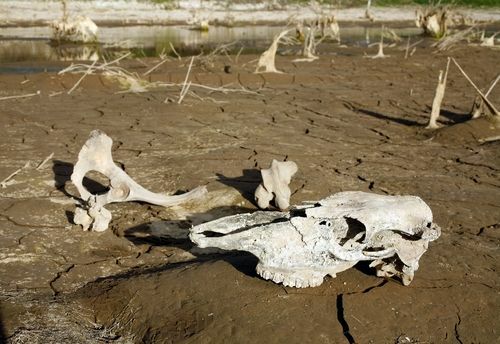 “What we’re seeing in the climate records is these megadroughts, and they don’t last a decade—they last 20 years, 30 years, maybe 60 years, and they’ll be semi-continental in expanse,” she told the Regina Leader-Post by phone from Vancouver. #12 Experts tell us that U.S. water bills are likely to soar in the coming years. It is being projected that repairing and expanding our decaying drinking water infrastructure will cost more than one trillion dollars over the next 25 years, and as a result our water bills will likely approximately triple over that time period. #13 Right now, the United States uses approximately 148 trillion gallons of fresh water a year, and there is no way that is sustainable in the long run. #14 According to a U.S. government report, 36 states are already facing water shortages or will be facing water shortages within the next few years. 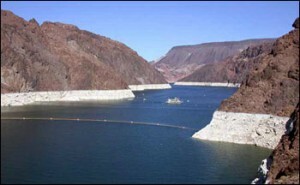 #15 Lake Mead supplies about 85 percent of the water to Las Vegas, and since 1998 the level of water in Lake Mead has dropped by about 5.6 trillion gallons. #16 A federal judge has ruled that the state of Georgia has very few legal rights to Lake Lanier, and since Lake Lanier is the main water source for the city of Atlanta that presents quite a problem. #17 It has been estimated that the state of California only has a 20 year supply of fresh water left. #18 It has been estimated that the state of New Mexico only has a 10 year supply of fresh water left. 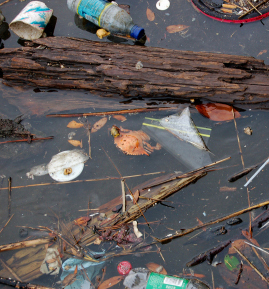 #19 Approximately 40 percent of all rivers in the United States and approximately 46 percent of all lakes in the United States have become so polluted that they are are no longer fit for human use. #20 Eight states in the Great Lakes region have signed a pact banning the export of water from the Great Lakes to outsiders - even to other U.S. states. Unfortunately, it is not just the United States that is facing a shortage of fresh water in the near future. The reality is that most of the rest of the world is in far worse shape than we are. Just consider the following stats…. -According to the United Nations, the world is going to need at least 30 percent more fresh water by the year 2030. -Global demand for fresh water tripled during the last century, and is now increasing faster than ever before. -According to USAID, one-third of the people on earth will be facing severe or chronic water shortages by the year 2025. -Of the 60 million people added to the cities of the world each year, the vast majority of them live in deeply impoverished areas that have no sanitation facilities whatsoever. -It has been estimated that 75 percent of all surface water in India has been heavily contaminated by human or agricultural waste. -Sadly, according to one UN study on sanitation, far more people in India have access to a cell phone than to a toilet. 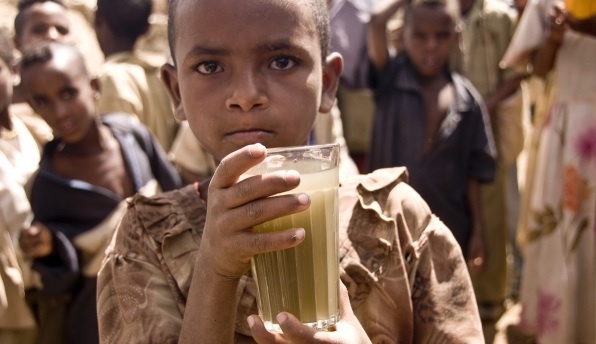 -Every 8 seconds, somewhere in the world a child dies from drinking dirty water. -Due to a lack of water, Saudi Arabia has given up on trying to grow wheat and will be 100 percent dependent on wheat imports by the year 2016. -Each year in northern China, the water table drops by an average of about one meter due to severe drought and overpumping, and the size of the desert increases by an area equivalent to the state of Rhode Island. -In China, 80 percent of the major rivers have become so horribly polluted that they do not support any aquatic life at all at this point. 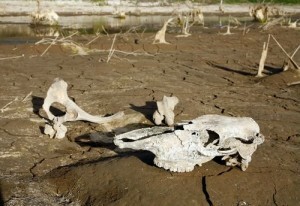 -In sub-Saharan Africa, drought has become a way of life. Collectively, the women of South Africa walk the equivalent of the distance to the moon and back 16 times a day just to get water. 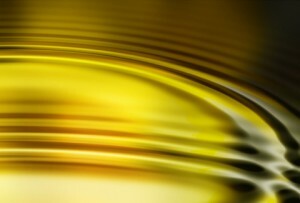 It has been said that “water is the new gold”, and unfortunately we are getting close to a time when that may actually be true. Without water, none of us could survive for long. Just try not using water for anything for 12 hours some time. It is a lot harder than you may think. We can’t grow our food in a pile of dust. Unfortunately, many areas of the heartland of America are slowly but surely heading in that direction. History tells us that it is only a matter of time before dust bowl conditions return to the central United States. We have used irrigation and other technologies to delay the inevitable, but in the end it cannot be stopped. Let us hope that the return of dust bowl conditions can be put off for as long as possible, but let us also prepare diligently for the worst. Where there's a well, there's a way. :-) you'd be surprised how easily it is to fill in cracks and crevices in our homes with 2 liter bottles of water. Also, so long as you don't fill them up all the way, you can keep the 55 gallon drums outside without worrying about them. Those 55 gal. drums are in short supply...waitlisted by major distriubtors. After your article on a possible water emergeny we committed to increase our storage. Just a couple of containers will set you back an easy $250 when you take into account the ancillary paraphernalia (AquaMIra, wrenches, siphon etc). Just found a place in South Carolina (US Plastic in Yemassee, SC) that manufactures them and for less. For the price of a road trip and ingenuity we can save some $$. Yes those 2 liter bottles are helpful for the short term but I'm sure for those with limited space one's "home sweet home" is beginnning to look like a warehouse. Just saying..folks...if your going to go big with large containers, don't just think about it. Crisco, I had no idea the barrels supply were that tight. Heck you can order them over the internet for $65-75.00 not counting shipping from several places. I picked up my last potable "stored water barrel" for $31.22 at a local farm store. These seem to be barrels used by bottlers for syrup for soda and drinks. I give them a good wash with a bit of dish soap, then a bit of bleach or safe sanitizer, a quart of Lemon juice and a gollon or water to kill any lingering syrup smells and let it air a bit and they seem fine. Some work if using recycled barrels but half priced compared to a new barrel. My channel locks work great at openning the barrels even under a bit of pressure and a pump siphon you can get at your local dollar store or food safe tubing can be had at your local beer/wine brewing store or via internet. My source was EE. I have ordered two 55 gal barrels and looks like a two week wait (if I'm lucky). Here is the killer - I've learned that shipping cannot be done by UPS due to the size and must came land freight...approx. $100 to a residence..so in the long run EE looked like a bargin with its $12.99 flat rate. The AquaMIra is onback order too. My impression is a lot of people are waking up! Thanks for your suggetions on using reclaimed barrels, but for us, that is not an option. We only have a Tractor supply in our small town and no access to the large type of barrels you suggest. I have been able to get 5 gallon food grade pickle containers from a local restaurant, wash, bleach and a lot of sunlight have mellowed the "affect". I will use these in conjuction with 2 rainbarrels for non-potable water. With all other storage facets space is really becoming an issue. But are these bottles BPA? Which has been proven to CAUSE infertility and Autism! Hi Kelene, Just a note, I have a book "We Had everything But Money"(Reminisce Books) about the Great Depression and the personal stories written by those who experienced it or heard stories passed on by relatives.. It tells about the Dust Bowl in detail Now these are individual accounts so its easy to read and I find myself picking it up often like a "Coffee Table" book. How the folks pulled together and made it. The courage and selflessness and most of all the Pride was incredable. I so hope we can muster up some of those values when our time comes. Thanks sooooo much for all you do. You are truly an inspiration. Joan, you had me at "book." :-) I'll have to find that one on Amazon somewhere. Thanks for the heads up. Try building a cistern, like they did in the old days. How DO you build a cistern? Scored a 55 gallon drum for $31.15 using Mom's 10% Senior discount.! Also figured out how to get the Kids water for about a week. Not much more we can do to help them if they won't help themselves. What do you think about the clear 55 to 100 gallon bags to use at the last minute that fit in your bathtub, in addition to pre-filled containers? Water bobs are another tool, however, I wouldn't rely on them exclusively as their or inherent vulnerabilities and assumptions made in using them solely. So last weekend our project was to get our 55 gallon barrels onto a rack system that allows us to store 3 barrels up and 2 barrels end to end. We connected our water barrels together via tubing on each side so now we can get water from the bottom barrel through a spigot. I thought we were doing well. Enough water for 3 months. Now I read the above and I am feeling a sense of panic...not so much for myself but for my children and their "water & food" issues that lack of water will / can create for their future. Going to set up another rack of water but still that is only enough stored water for 6 months. I glanced at the water barrels that surewatertanks.com that has larger water drums that can fit in your basement. It is looking more important now. Do you think this is related to the "whispers" in your ear about water storage earlier? or just another aspect to consider? Thanks for your research and sharing with others. Assume there is a water crisis! We will have a major sewage crisis if the water plants can't treat water for a month. ( My guestimate not based on nothing but 13 years in the military and my own research, plus watching OWS) It's taking millions of dollars to clean up after OWS with vermin and filth at best poured in a porta-potty at worse saved in bottles and jugs and poured into storm water outlets. That's the water in you creeks and rivers treated minimally if at all. Still want to depend on your local creek or lake for water? I have had a discussion with friends about water storage. They insist that water should be changed every six months even if stored in a water approved container. It seems to me this is a waste and if the container is water approved then it should not leach any harmful chemicals. Am I wrong? The article is really an eye-opener for me especially since I live in the southwest. We have experienced times where our water has run short and the bills have soared. I have said over and over again that water does NOT need to be changed out every 6 months. I wish people would stop sharing such ridiculous notions. If water needed to be changed out every 6 months I am sure water bottles would have a 6 month expiration date!. Dumping a precious resourse every 6 months is not going to help the shortage either. Water sisterns (spelling) to catch rain water works well too. I grew up in AZ with no running water and thats how we got our water. Or had it hauled in. I have been expereimenting with water saving actions, for some time. Like not showerong until ur body cries out for relief, desiring a shower. I do is sit in my recliner, all day. I only leave the chair to go to the restroom..
dennis, You want us to pray to scientists? or go 3-4 weeks without a cleaning, to sit in and easy chair all day and hope someone saves us? Huh? Okay I maybe silly praying to my God and without faith I could see that as an argument. But praying to scientists, really that's a solution? Suffering in filth for 3-4 weeks in an easy chair constitutes prepping in your mind. Since you only get up to go to the bathroom I wonder who feeds you and what and where. Oh just second thought, I don't think I want to know. dennis not to be mean but I think you have reached the human equivalent of a mushroom. If you want to see what Kellene preaches on preparedness look at the bottom of the page and click on any one of the links under Category and the links to the 10 steps of preparedness. Kellene never suggested rationing water. She simply suggested more and now might be a good time to get it. Ahead of time you might be out of a bit of time trouble and a bit of cash. At worse within 12-36 hours lack of safe drinking water kills you. Dennis, to solve this problem you need to store water and that's what Kellene recommends. Are you dense? Jamie, I think you jumped the gun on this one here. Dennis is NOT saying we should pray TO scientists, but FOR them - that is a huge difference. We pray for church and government leaders regularly, why not our doctors and scientists too? And he's not telling you he's a lazy, do-nothing either. He's admitting that he is on a disability-induced bed-rest type of situation. His care provider has told him his injury needs to be rested in order to heal. That does not make a person lazy. He's simply sharing why delayed showering (water saving strategy) is so doable in his circumstances - he's not breaking out in a sweat every day from manual labor, because he's on a modified bed-rest. He's saying that this water saving strategy may not be as helpful for a farmer, or an auto mechanic, or any other manual laborer who regularly works up a sweat. He is sharing valid concerns/fears about the reality of what may happen with a lack of water. Nothing he said deserves the rudeness with which you attacked him. Play nice. Not everyone is on the same level of preparedness as you; some are better prepared and others are just starting out and may be completely overwhelmed with all there is to do. We're all here to learn, not to be called names and made to feel worthless. Dennis, you pray for those scientists to find good solutions - I'll be praying right along with you! Just be sure to do your own part in your personal preparedness and don't only rely of science to save us. :O) Begin (if you haven't) to store as much water as you can and continue your noble efforts to conserve as much of it as you can also (and never mind any naysayers!). Keep up the good work! I hope your injury heals well and soon and you find yourself back on your feet again. God bless! Hi, Dennis. Just a quick note to see how you are doing. I remember the first winter when my husband became disabled. I was working and it was driving him crazy. Take each day as it comes. Found my answer on another page. Stored water can be changed out every five years or so. Good to know. These seem to be used syrup barrels, Give them a good wash and sanitize and they seem fine. If the oder lingers a strong lemon juice solution seems to work well for my barrels. If you go for barrels get a good siphon or pump. Wherever you put you barrel she will be staying there till almost empty. Pliers or channel lock tools will open the lids until you get a dedicated opener and having a few smaller 3-5 gallon jugs to transfer water too and they are easy to move and use. I did a 2 year water test on a couple of soda botteles in storage and the water tasted fine if a bit flat. No outbreaks of nasty stuff. It was stored City tap water and no added protection. Just store in a cool, dark place. Good news in a way, with the extra barrel I secure my own drinking water and I'll be able to provide my non-prepping family members with about a week of water each. I wish I could do more and I really wish they would do more to protect themselves. You do what you can, pray and hope for the best. Where do you get your barrels from? @ Janeen I get mine at a local farm store called D&B. But if you have a local botteling plant you might get them even cheaper. Though you may have to clean out the residule syrup. The barrels I have bought have been sprayed with water and cleaned somewhat. I recommend a good cleaning and sanitizing if using recycled barrels. For lingering oders a pint of lemon juice swished about the barrel does wonders. A bit more work compared to shipped in fresh barrels but a bit cheaper. I know Kellene does not give warning signal just for giggles. She might be wrong but at worse you have a bit more watered stored and it won't spoil and you are ready for a camping trip or tailgait party. Perhaps a little storm and localized power outage. Oh boo hoo she help you to be more ready than you needed to be. Or you stocked enough on hand to help others. I trust her and even if she is wrong on effect or timing I will have to suffer of having safe water stored. Oh , darn who will save me from the evil of Kellene's idea of having food, water, first aid, sanitation and to mentally,spirutually and finacially prepared for whatever life throws at us. "Oh, boo hoo she has helped you to be more ready than you needed to be" cracked me up, Jamie! If anyone has a bakery factory close by you can get barrels and other storage tanks from them. We have a McKeee baking factory here (Little Debbie) They sell their 55 gallon syrup barrels for $8 and 275 gallon Sorbitol tanks for $20. The sorbitol tanks are white plastic with a screw cap on top and a faucet thing on the bottom. They are situated on a pallet and inside a cardboard box which helps insulate them and keep out light. You just have to wash them out good. Also they can be stacked 2 high if needed. They can be stored outside and tarped to keep the rain off of them. be sure to use bleach and the blue Dawn dishwashing soap to clean those out with the best results. It has links within it to all the resources used as well. The history channel put a show together a few years back. I want to say 3 back, but it comes on every year. it's real imformative. I think it's call Black something. I can't remember the next part, but it did start with the word Black. Yeah, I saw that, James, but it doesn't give a by-line. Thanks so much for sharing this with us. I am in the process of buying a home and its so crazy how things change. Ten yrs ago when I purchased my first home, I was looking for granite counter tops and luxurious carpet! Today I look for gardening space and my own private well!! Not to mention, a wood burning stove, not always easy to find when you live in California! My goal in purchasing a home is solely on the thought of preparedness. I do worry that the window of opportunity for preparing is starting to close. I wish more people would listen. Thanks for all you do, it is greatly appreciated. You sound like me, Natalie. Isn't it interesting how drastically our priorities change once we start thinking about self-reliance? Water shortage is another reason every prepper should investigate aquaponics. Fish are raised in one large tank. Their nutrient rich water is pumped through growing trays, feeding the plants and cleaning the water. The water is then recycled back to the fish tank. It takes 90% less water to raise a given quantity of food this way than with traditional farming methods. A single family can do it in the backyard or it can be scaled up to feed a whole community. The Mittleider Gardening method is also a good asset on top of your aquaponics. It's referred to as the poor man's hydroponics. It allows you to grow massive amounts of produce using 70% less water than other systems/methods. I believe in back ups to back ups so I believe that these two methods together would be ideal. If you look up the words "doomsday preppers pilot" on YouTube, you'll see a GREAT example of aquaponics implemented by one of the preppers in AZ. Water is one of my biggest worries. We have lived for days without being able to get water from our well due to wildfire that took our power out. We need a generator but we are not able to afford one at this point in our retired life. Water storage? Our water is not palatable. Our water has a high sulfer/iron content and also contain sediment...a .lot of it. We had a 5000.00 water filtration system in place and after 6 months they would no longer honor the warrenty due to our water damaging the equipment. So we go to my son's house 40 miles away and fill 5 gallon water bottles for drinking and cooking and bring them home to be used in a water cooler. The livestock all drink the well water so at least there is that. We have a large storage area at the farm but how to get those 55 gallon barrels filled and stored is not exactly a job for seniors to do. I can buy water in bottles by the case and I do but the amount of water that we would have to buy is rediculous. I don't think it is reasonable that any of us could buy enough water to last thru one of the drought senarios listed above at any rate. So if you could store for a year or even two what then? I thought I was going to be prepared by having enough water for both of us for 6 months and with our filtration systems less tasty water for another 6 months but if the water is going to be gone or at the least very limited what then? Stephanie, if I were you I'd put a call into the folks at Aqua Mira and share with them your water taste/content problem. I'm certain they have a solution for filtration that's affordable. As for the barrels, I'd fill them up with a very long hose without treating the water in the first place other than a cup of bleach for each 55 gallon barrel. Then I'd worry about filtering it once it's extracted from the barrels as you use it. I hope this helps! We may have to do that Kelleen, but just the idea of drinking orange water that smells of rotten eggs is just so unappealing. I did find a system of sealable 5 gallon bladders that fit into heavy cardboard boxes and stack 3 hight. The boxes/bladders sell for 30.00 for a set of 5 (25 gallons) they also advertise that the system can also be used as an emergency toilet if need be. Not sure how that would work or what you would do with the contents but I suppose there must be some instructional materials with the system. This would at least give us a manuverable water system until I could get something resolved with the large barrel idea. Another question OT I have is how to make the fuel cylinders I saw on NG's Preppers last night..anyone know? A simple search engine search will give you all you need to know to make fuel tablets out of newspaper. Easy Peezy. Stephanie, first of all I owe you an apology I missed this posting. If you could answer the following questions to help me, I am hoping to help you. Has your well always had the iron ore in the water? Was the sulfer in the water at the same time, or did it come into the water system later? Is the pump at the bottom of the well or setting at least 10 feet above? Has the quality of water coming out of your well been this bad from the beginning or has it progressively worsen over time? This information will assist me pinpoint what is going on with your well water. I understand your concern on not having good quality potable water. Have you ever consider contacting the Dowsing Society for assistance on your water problem? For those who have never heard this term we were once referred to as water witches(dislike that terminology). Like all who give advise, the society has master dowsers that train students who are certified by an accredited dowser. Any professional dowser must continually upgrade and work on their skills. If you use a dowser make sure they have been to an accredited class. The main point of the article was about the overall problem of water table decline. This is a separate question from individual water storage. The only solution to the big problem is to capture and use the water in rivers before it flows out to the ocean. This means more reservoirs capturing it and using it for irrigation, with any excess spread on the land to replenish the aquifer. This will decrease the dependence on the underground aquifer. This is already being done on a limited extent in many areas of the US. Unfortunately, the extreme environmentalists will not let any new dams be built. I found a bunch of postings on Craigslist for food grade storage barrels. Although it is my understanding buying new barrels is the ideal way to go, those of us who can't afford to do so should look into used food grade barrels. The ones I saw ranged in price from $12 - $22 for 45 gallon, 55 gallon, and 66 gallon. For larger purchases, one or two of the sellers offers delivery for a fee. Having water stored that tastes like pickles or red pepper (or whatever other food item that was originally in the container, if the flavor leeches into the water even after a thorough cleaning of the barrels) is better than having no water at all and watching your loved ones die of thirst, as well as yourself. I've used lemon juice to kill the leeching of flavor 16 oz. of lemon juice to about 1.5 gallons of water on the big 55 gallon + barrels. I've heard and read others that swear by vodka for cleaning barrels. I've used the lemon juice method not vodka method. Kellene, your article the other day "clicked" when I read about the upcoming probability of another dust bowl. Someone whom you talked with mentioned "water stored covered and inside" and this fits the dust storm scenario. I just finished reading a nonfiction recount of the Dust Bowl, and then all this information surfaces... quite an eye opener. Thank you for your efforts and your information. Oh, and I hope your big dinner is wonderful! Crisco...barrels are wait listed at major manufacturers? Perhaps in your area but that isn't the norm. I just a called a local supplier (I'm the director of procurement for a large construction company) and I can gets hundreds of brand new ones with almost immediate delivery. I never have to pay more than $30 bucks for the blue ones and about $20 for the black ones. Many manufacturers and food distributors use them and it's a matter of getting in touch with the right person who will let you buy them. Some companies ever through them away. Most of the ones I bought have needed just minor cleaning. The article was a little over the top and seemed to deliberately leave out a lot of facts, for example Lake Meade is higher today than it has been in 30 years due to strong snow run off the last few years in the Rockies. Much of the Texas drought has been eased through excessive rains the winter. The historical part failed to mention that the dust bowl in part was caused from farmers stripping the prairies from all trees and grasses and causing topsoil run off and erosion due to their own excessive and incorrect farming. Today the bread belt has been heavily replanted, most farmers through the plains plant wind breaks and rotate lands. Many areas are now set apart for grasslands further protecting the topsoil and easing erosion. I'm not claiming a water shortage is not coming, in fact I'm sure it is coming. It's too bad we don't have the national will to build reservoirs to balance our water so that areas in the Midwest and south which often flood could divert water to other areas. We need a national canal system crisscrossing the country and gated to move flood waters to where ever we need it. Whenever there is a drought in one place there is flooding in another. The Core of Engineers have plans for this but no one wants to mess with the EPA and environmentalists to take it on and build it. Think of the 10s of thousands of jobs this would create for decades too. Michael, I recommend that you read "The Edge of Disaster" by Stephen Flynn. It's chocked full of great information as to the infrastructure condition of our nation. Perhaps it's because I've read this book that so much of what was shared in this article resonated as plausible to me. It really is an interesting lead with a great foundation of research to back up the info. The Worst Hard Times: the untold story of those who survived the great American dust bowl, is a great book that follows the lives of several families and also the causes of the dust bowl. This book is about survival, like canning tumble weed, and people dying from a cough associated with the dust storms. I think that having another dust bowl like we did in the 30's is somewhat unlikely but the reality of having a long term drought and using our current water sources up is a reality. And that is why this article is great. My husband and I just bought 4 blue 55 gal. blue barrels. Because of space we wanted to fill 2 drums, stack the other 2 on top and then fill them. Does anyone know if this is safe? Are the barrels strong enough to support the weight, could they split? Unless you build a rack that's specifically for this purpose you wont' be able to stack them safely. There are pictures on the internet that show the racks which put the barrels on their sides. Kellene, I am currently reading "The Worst Hard Time" by Timothy Egan. Great story of the dust bowl and how those people survived. Many consider that time worse than the great depression. Thanks for enabling my addiction, Laura. :-) I just bought it off of Amazon. What most people do is simply build a small room of concrete and just line it like you would a swimming pool.